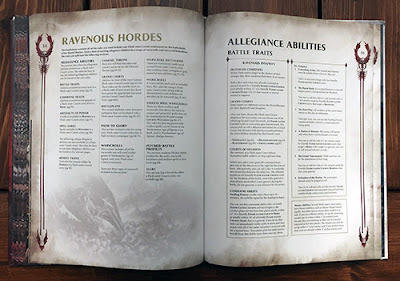 Flesh-eater Courts now join the ranks of Stormcast and Khorne for having a second version of their battletome. They were one of the last battletomes to come out before the first General's Handbook, and now they get the full second edition treatment, so what's changed? I know I talk about the covers a lot, but I really like this one. It has a strong graphic design element to it that really speaks to me. That bright, deep, saturated red background frames the Archregent perfectly. There's still details in the background, like a terrorgheist perching to the right, but it's all flushed in the bright red. It speaks to the nature of the Flesh-eaters as well, with their insatiable blood red appetite. It's just a really strong and bold cover. Probably one of the strongest covers out so far. If you've read the previous Flesh-eater book, or really anything about them, then you probably already know the core of their background. 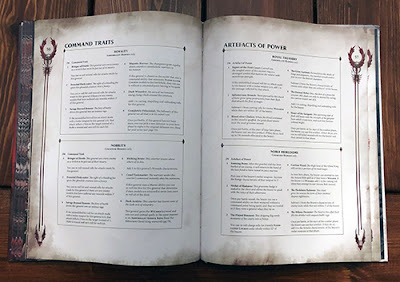 All of that has stayed the same in the new battletome, but it doesn't make it any less awesome. For those who may not know, the basics of the Flesh-eaters is that they aren't just cannibalistic ghouls (though they are that too), they're delusional cannibalistic ghouls who see themselves as noble knights and fair kingdoms. Basically the exact opposite of what they really are and it's awesome. Where others may see the Crypt Horrors as towering monstrosities that tear into their enemy's line with a violent fervor, the Horrors instead see themselves as noble knights riding into battle against the monstrous foe. It all started in the Age of Myth with a figure called Ushoran, the Carrion King. Ushoran was a noble lord who served Nagash. Though he served Death, at that time he tried his best to be fair and just and traveled the realms establishing kingdoms and the rule of law. Near the end of the Age of Myth Ushoran angered Nagash in some way, who in turn cursed his servant with a hideous transformation. Now shunned by those he wanted to help he started ravaging the realms, before he was imprisoned by Nagash. 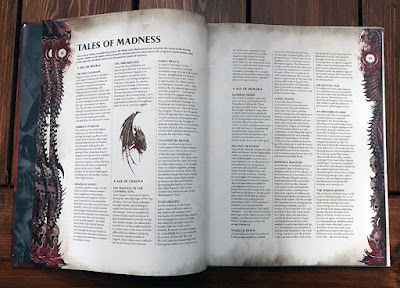 In this prison he devolved to madness, and it wasn't until Sigmar accidentally freed him during the Age of Chaos, that that madness began to spread. The vampires sired from his blood became what are now known as the Abhorrant Ghoul Kings and Archregents, and this is where the tale of the Flesh-eater Courts truly begins. During the Age of Chaos many empires and civilizations fell into ruin and their inhabitants were forced to eke out an existence in their new harsh reality. As food became scarce this often involved cannibalism. It wasn't until an Abhorrant arrived that these fallen kingdoms truly transformed into a Flesh-eater Court. 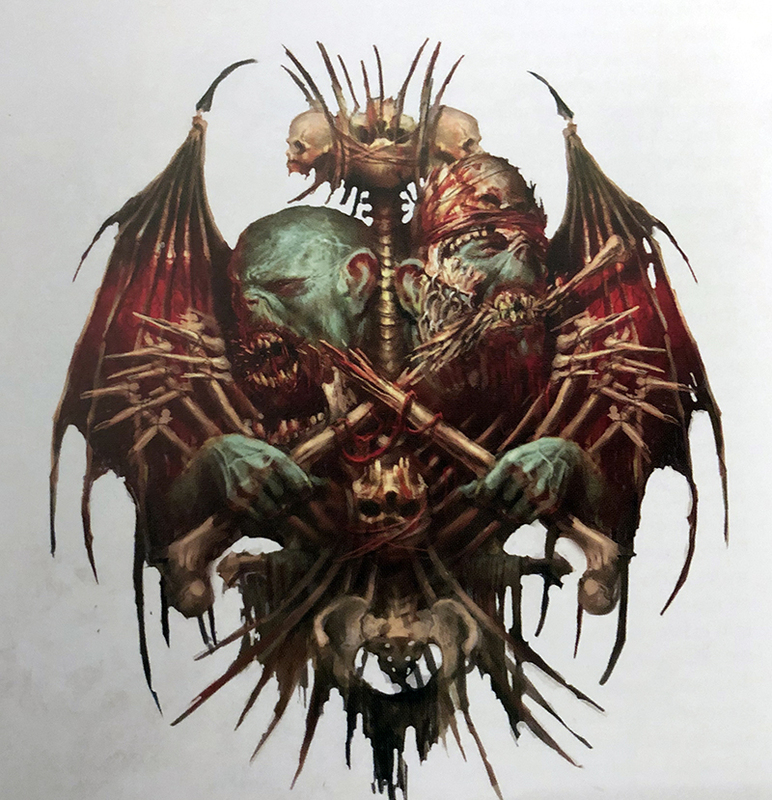 The Abhorrants were drawn to these cannibalistic sects for whatever reason, and once there, they infected all those around them with their own sickness. No longer were they wretched ghoul infested dens, but instead they were fair kingdoms with a regal king, at least in their own eyes. 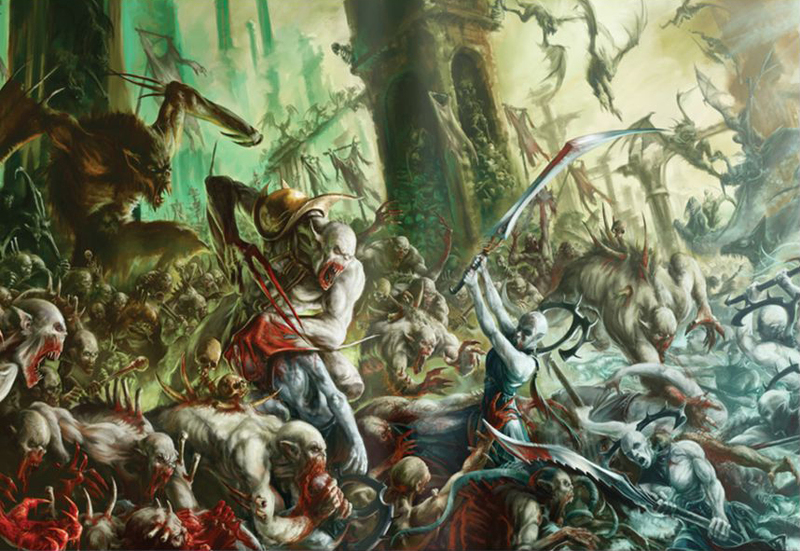 In this way Flesh-eater Courts were established throughout all of the Mortal Realms during the Age of Chaos. Though they fall under the auspices of Death, they are not truly dead themselves, except for the vampiric Abhorrants. The ghouls themselves teeter on the brink. 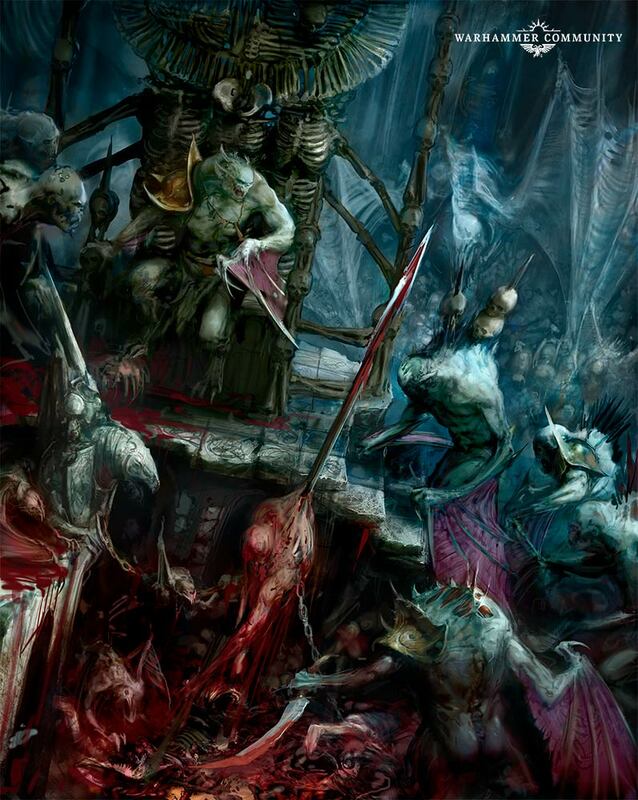 In this way they are not truly under Nagash's rule, since he cannot exert his will over the living. 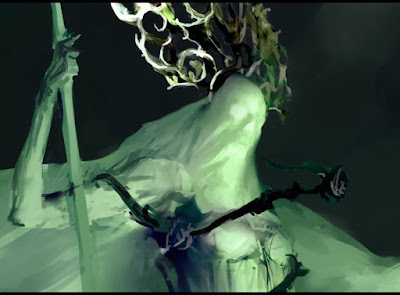 They also view Nagash with differing attitudes depending on the court. Some worship him as a god and may see him as a benevolent deity in golden robes, while others fear him and do all in their power to stay out of his clutches. These are often the courts set up in the Realms most removed from Shyish. 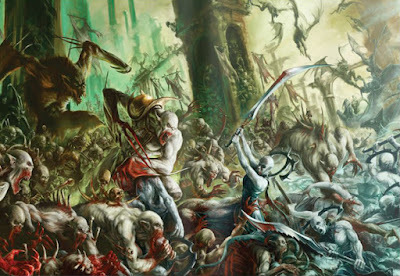 In a new bit of lore that I really liked it talks about how the Flesh-eater Courts work with the system of underworlds within the Mortal Realms. Since they saw themselves as being right and just, and probably had their own vision of an afterlife in their own deluded minds that was far removed from their horrible existence, when they died they went to the ideal afterlife as they saw themselves. This means that though in life they may have been a horrible ghoul that only caused suffering, in death they would pass into an afterlife as a normal human and receive all of the rewards of leading a perfect life. It's a wonderful little twist that really fits their deluded minds. Since the Necroquake though all of this has changed. Now they pass into their afterlives as a horrible, cannibalistic geist who hunts down and devours the other frightened inhabitants of their afterlife. They also see the Nighthaunt hordes as benevolent forces. For instance, if a Nighthaunt procession passes through a Flesh-eater kingdom, they will often kill all around it, but have no interest in the mortal remains, which the leave behind. 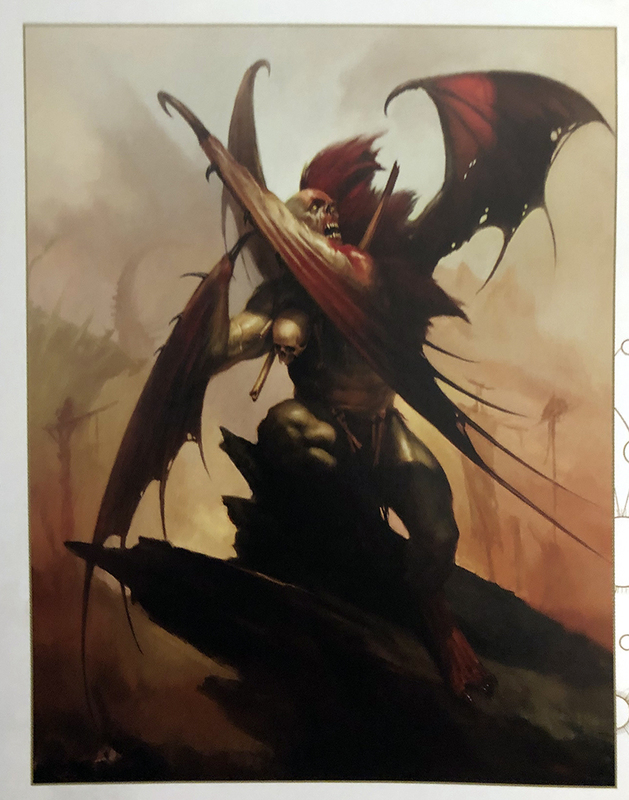 Since this would be a fantastic feast for the Flesh-eaters, they see the Nighthaunts as peasants from a neighboring kingdom who have come to harvest all of their fields for them and present them with a bounteous gift. They also see Lady Olynder as a beacon of hope and a savior from their gods sent to lead them to greatness. 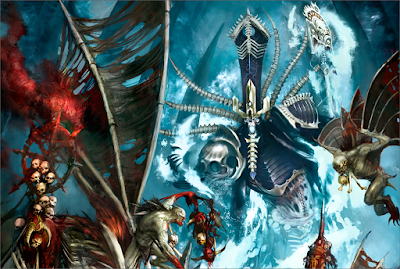 In contrast, they see the Stormcast as horrible, ghoulish invaders who must be stopped at all costs. It's great. 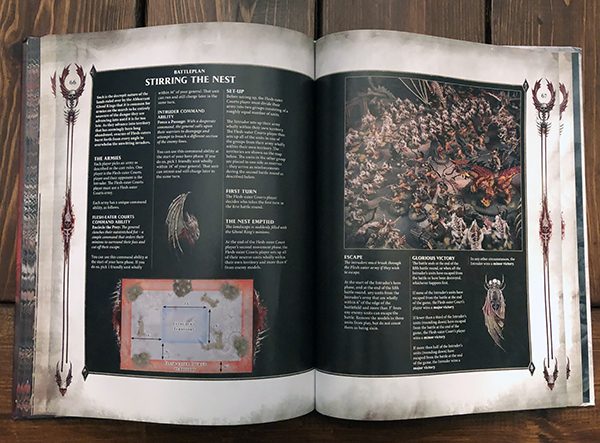 The timeline section covers everything from Ushoran's exploits from the Age of Myth to the Souls Wars in the Age of Sigmar. There are some great bits in here, like how the Kharadron of Barak-Urbaz were hired to exterminate a Slaaneshi cult by a pallid figure. After completing their task they went to collect their payment and found a horrible ghoulish kingdom, though they were paid in the 50,000 gold coins they were promised, at least in the ghouls' eys. In fact, they were paid with 50,000 human vertebrae. 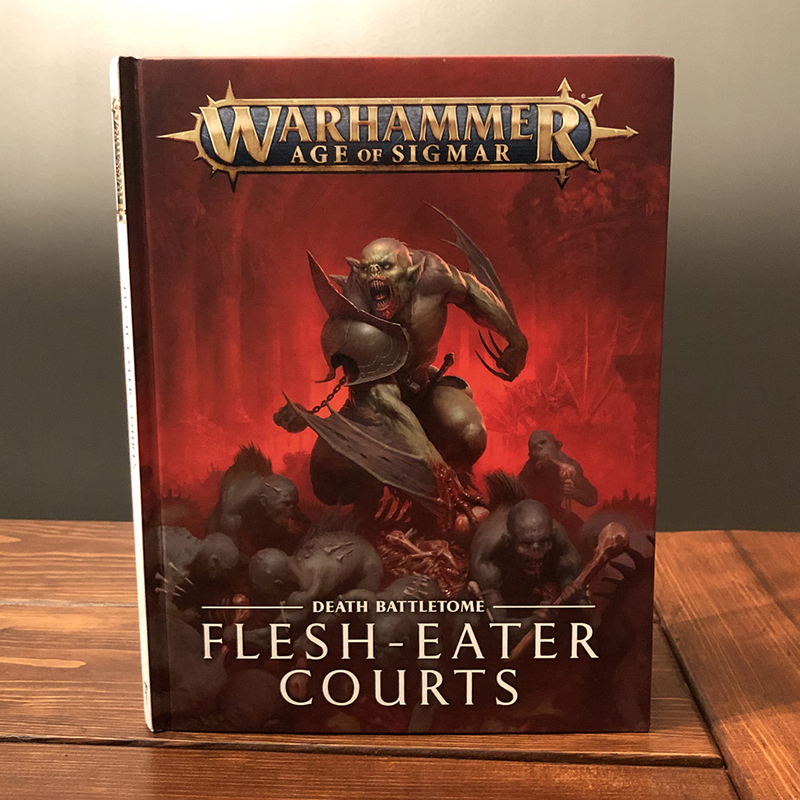 We also take a look at how a typical Flesh-eater Court is organized, which is usually based off of Ushoran's original court. 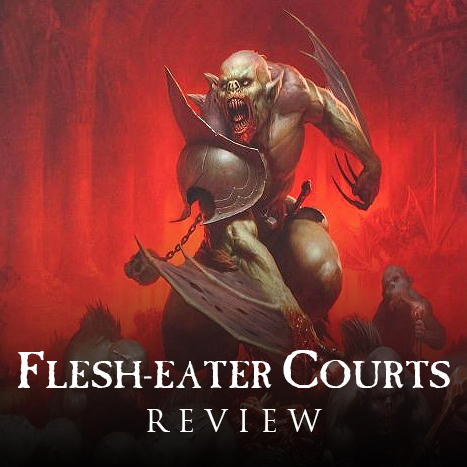 For the first time we also get a look at four of the most prominent Flesh-eater Courts. The Morgaunt Courts are the ones we see in most of the GW pictures. They're the pallid ghouls with the red hands. In life they were noble kingdoms within Shyish who protected the living and lived alongside the dead in peace. After the Chaos invasions laid low their empires, they were reborn as a horrible Flesh-eater Court. They now spread across the Mortal Realms, seeing Nagash as their one true god. The Hollowmourne court are the greenish ones we've seen. They hail from Chamon, and were an empire of crusading knights who sought to recover and protect precious relics. Now in their deranged state they attempt to continue this quest, their numbers flush with massive Crypt Horrors. The next two are my favorite, the Blisterskin and the Gristlegore. The Blisterskin were an empire of fervent sun worshippers from Aqshy. 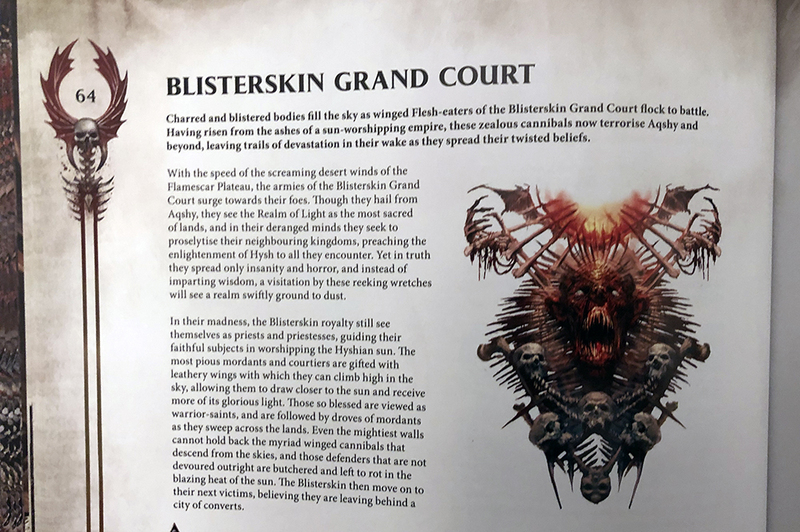 Now as a Flesh-eater Court they still see the sun as being holy and bask in its warmth, their skin burnt and flaking. The most worthy of them have even grown wings to be able to be closer to their god. Gristlegore hails from Ghur, and once lived in peace with the beasts of the land. Now they ride to war a top these giant undead monsters, an army of champions and beasts. The unit section dives into a little more depth on each of the individual units of the army. The Abhorrant Archregents are Ghoul Kings who have lived for centuries and grown in power. They rule over entire empires and are the most powerful of their lot. They often let their subservient kings carry out their wars, but will stir themselves for battle in the most important of circumstances. 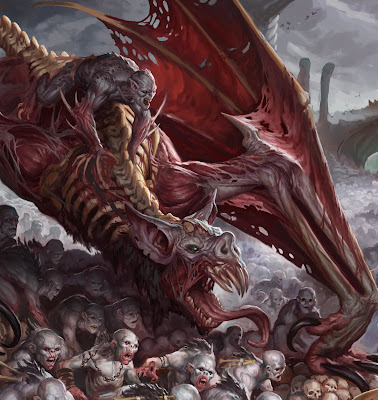 Crypt Flayers are ghouls who have feasted upon a mix of the King's blood and Terrorgheist flesh, while their courtiers have been given a feast of Zombie Dragon flesh. The new Endless Spells also get a bit of exploration, with the Cadaverous Barricade appearing as a wall of noble ancestor spirits sent to protect them to the ghouls of the Flesh-eater Courts. The model showcase section has some really cool pictures in it. I really enjoy these scenic shots and they continue to improve with each book. 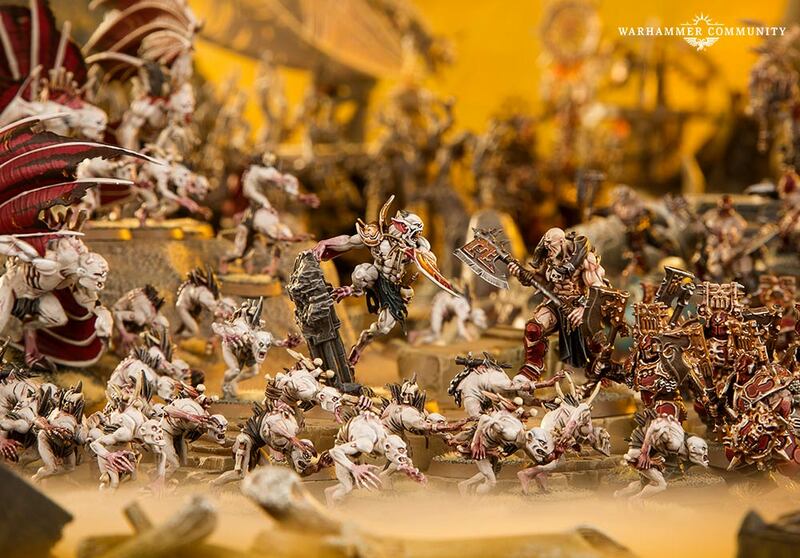 They are just so atmospheric and do a great job at making the models and the realms feel real. Beyond just showing off the 'Eavy Metal models we also get to see some example color schemes for all of the major courts as well as some Flesh-eaters from the various realms, such as Hysh and Ghyran. There's a paint guide section as well where they give a step by step guide for each of the four major courts. I really like the Blisterskin paint scheme. 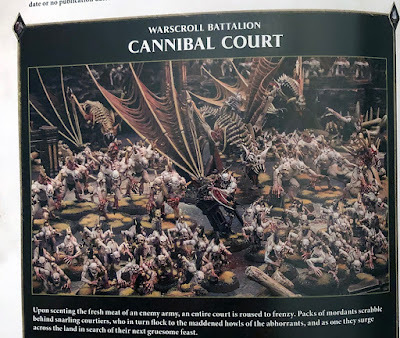 They also go over various other things you would come across in a Flesh-eater army like Terrorgheist flesh and some really cool basing ideas. There are some great ideas in here and I hope I see some of them implemented across an entire army on the tabletop. It would look awesome. Now onto the rules section. Just like every other Death force out there, they have their own version of the Death save. In this case it's the Deathless Courtiers, which affects any friendly units wholly within 12" of a Flesh-eater Courts hero. This is pretty standard and something I would probably expect to see on all Death armies. 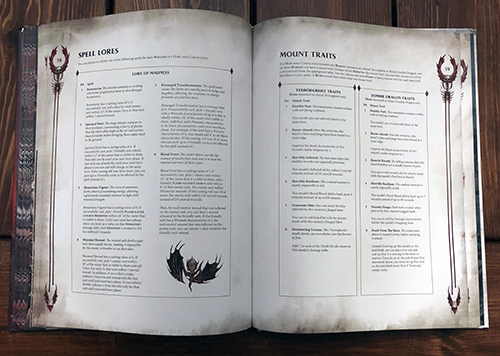 Next you can either pick for your army to be one of the Grand Courts, which have their own special rules that I'll get to in a little bit, or you can pick a delusion off of the Courts of Delusion table. This is pretty much what you have seen in the last two General's Handbooks for them with some reworked rules. There are six delusions to pick from (or roll for if you prefer), and they apply to your entire army. For example, there is the Crusading Army delusion that allows you to add 1 to run and charge rolls, or the Grand Tournament, which allows your heroes, other than your general to re-roll hit rolls of 1. Like I said, there are four more of these, but I think we will see most people picking one of the Grand Courts instead. Last, but certainly not least, is the army command ability, Feeding Frenzy. This allows you to pick a friendly unit within a certain range of one of your heroes or general and pile in and attack for a second time in the same combat phase. You can't pick the same unit twice in the same phase, but I can see several command points getting used to pick several different units within the same turn. There are two sets of Command Traits to pick from, one for your Abhorrant Heroes, and one for your Courtiers. Each of these have six to pick from. 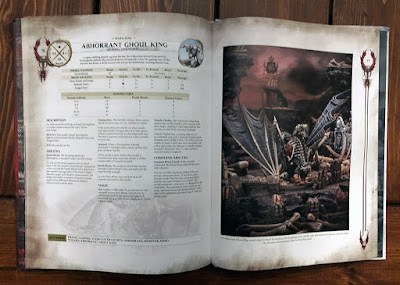 My favorites are the Majestic Horror for your Abhorrants, which allows them to use their command ability that summons models to the table without spending a command point (though the command ability will still be a one use), and Dark Acolyte for your Courtiers, which makes him a wizard equivalent to n Abhorrant Ghoul King. There are other good ones too, which gives boosts to casting, or re-rolling hits, or one that explodes a hit into two hits on a roll of a six, so I think we will see some variety. There are definitely a few stand outs though. The artifacts are split into similar tables for Abhorrants and Courtiers. I like The Dermal Robe for Abhorrants, which gives them plus one to cast, dispell, and unbind rolls. You can combo that with the Dark Wizardry command trait for a total of plus two to those rolls. The Bilious Decanter for Courtiers is a one time use artifact that gives them two extra attacks for each of their melee weapons for that phase. The Lore of Madness has six spells in it that can be taken by any Flesh-eater Wizard, meaning Courtiers too if they've been made into a wizard via a command trait. There are some seriously nice choices in here. Spectral Host stands out right away, giving one of your units the ability to fly, or if they already can fly they can run and charge! This will be great on the big monsters or the Crypt Flayers. Monstrous Vigor allows you to treat a friendly monster as if it had suffered zero wounds on the damage table. Meaning you can take a Zombie Dragon or Terrorgheist that's on one wound left and have it attack at full strength. Deranged Transformation lets you add a units wound characteristic to its move value, giving you some serious speed. Some of these have bonuses if you cast them on a 10 or more as well, such as Spectral Host then allowing you to pick up to three units to be affected. That's not an unmodified 10 or more either, meaning if you take the trait and artifact that give you a plus two to cast combined, you'll be getting that bonus on an eight! There is also a set of Mount Trait tables for the Terrorgheist and Zombie Dragon respectively. There are a few that are the same on both, such as Razor-clawed that improved the rend by 1, but they also both get some unique ones like Gruesome Bite for the Terrorgheist, which allows you to re-roll failed hit rolls for its Fanged Maw attack. 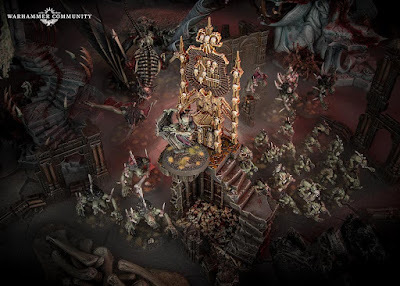 The Charnel Throne is the new unique scenery piece that the Flesh-eater Courts get to take. It's set up like most other scenery pieces such as the Herdstone. This throne is inspiring for Flesh-eaters, and sinister for the enemy. In addition, it allows Abhorrants to use their summon command ability without a command point if they're within 1" of it. Now onto the four different grand courts; Morgaunt, Hollowmourne, Blisterskin, and Gristlegore. 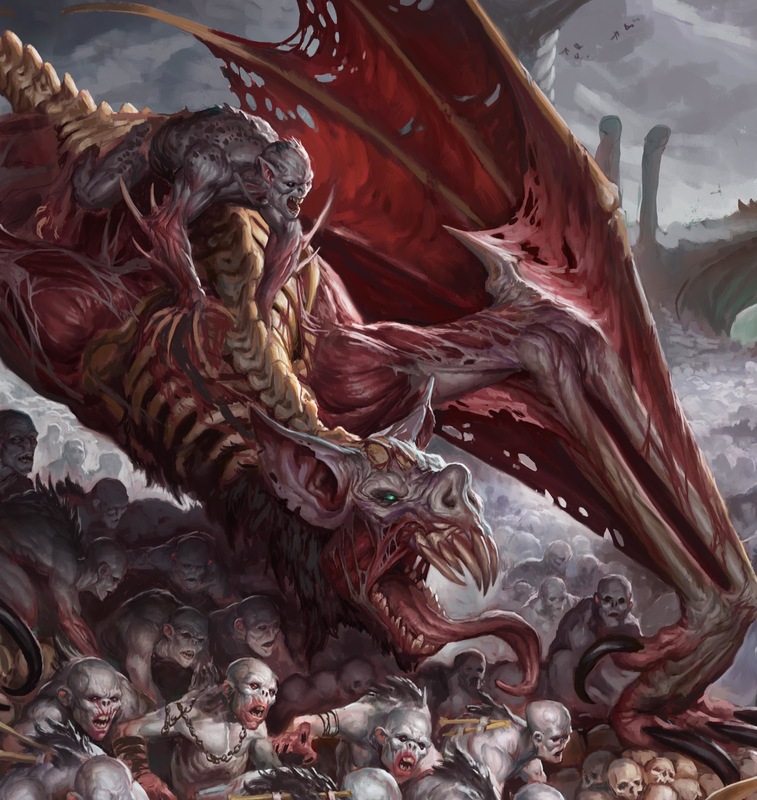 These are essentially the Flesh-eater equivalents of the Stormhosts. Morgaunt is all about ghouls, and lots of them. It's ability, Blood Loyalty, gives you bonuses for having your courtiers near serf units (this is a keyword regular ghouls have), and also gives your ghouls their Boundless Ferocity rule at 10 models instead of 20. Their command ability is like the Hammers of Sigmar one, and allows you to bring back slain serf units. The command trait boosts your general near serfs, and the artifact make nearby units immune to battleshock, again, great for large units of ghouls. All of these replace the normal command traits and your first artifact as normal. Hollowmourne on the other hand is all about the Crypt Horrors. Everything you get revolves around boosting them and things near them. Re-rolling hit rolls of 1 on the charge, and being able to run and charge, and adding 1 to it. The artifact and command trait gives your hero a boost in combat under certain circumstances. If you take Hollomourne as your court then Crypt Horrors are also battleline for you. Blisterskin is along a similar vein, but with Crypt Flayers. They become battleline (which is awesome), get a boost to their movement, and have a sort of teleport command ability. Gristlegore is the most exciting to me, mostly because it turns unridden Terrorgheists and Zombie Dragons into battleline! Their monster and hero attacks also explode on 6s, meaning they're going to be extra nasty in combat. Their command ability is also really cool. If a friendly monster is slain within a certain distance of your hero, they can pile in and attack before they're removed. Combine this with Feeding Frenzy and you can get a ton of attack out of one monster. The battleplan is called Stirring the Nest and reflects an invading army accidentally stumbling across a Flesh-eater Court. It looks like it could be pretty fun, with the invader having to get more than half their army off any of the table edges to get a major victory. The Path to Glory section is what we have come to expect from the Battletome, and provides a bunch of cool tools for narrative games. The battalions are all updates of the existing ones more or less. We get seven regular battalions and one mega battalion. Deadwatch for example, includes 1 Crypt Infernal Courtier and 3 units of Crypt Flayers, and allows you to pick 1 unit from the battalion in your hero phase that are alreay within 3" of an enemy unit and pile them in to attack with all of their melee weapons. With the upgrades that Crypt Flayers got I can see this being a popular one. I think Royal Menagerie will be popular with the Gristlegore grand court since you'll probably be taking that many monsters anyway, and this way you'll get a bonus heal, as well as the extra command point and artifact. The only new unit in the army is the Abhorrant Archregent. This guy is pretty good and will probably be in almost every army list. He's essentially an even more powerful Ghoul King, with one extra attack and one extra wound; but he has some awesome special rules. He can cast two spells a turn and his warscroll spell allows you to give D3 extra attacks to a friendly unit within range. That's an extra D3 attacks per melee weapon. His command ability also allows you to summon on a unit of 20 Serfs, 3 Knights, or 1 Courtier. It's a one time use command ability, but it's pretty darn good. 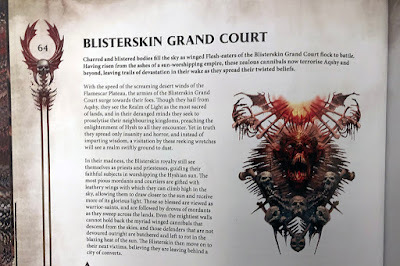 That's the other big change to the Flesh-eater Courts, new keywords. Serfs are the Ghouls, Knights are the Horrors and Flayers, and Courtiers are Courtiers. This doesn't really effect anything, but it just cleans up the wording on certain abilities since it just refers to the keyword now. Crypt Flayers are the other unit that got a good boost. They now do a mortal wound on an unmodified hit roll of 6, in addition to any of their normal damage. Their scream attack is also pretty much like a Tomb Banshees now. You roll 2D6 per Flayer and compare it to the enemy's bravery, doing the difference in mortal wounds, though you do subtract 2 from the roll if you're not within 3" of the enemy unit. It's a nice little touch that reflects how it wouldn't be as powerful if they're not right in your face. There are little tweaks elsewhere, but nothing too major. All of these warscrolls are available on the App, so I'm not going to spend much more time talking about them. The last new additions are the three Endless Spells. These can only be cast by Abhorrants or Nagash. My favorite is the Corpsemare Stampede just because it looks so awesome, it's pretty good to. It can move 14" a turn and for each unit it passes over you roll 5 dice. For each roll that is more than the units wound characteristic you do 1 mortal wound. That means on units of 1 wound models you'll be doing mortal wounds on a 2+. 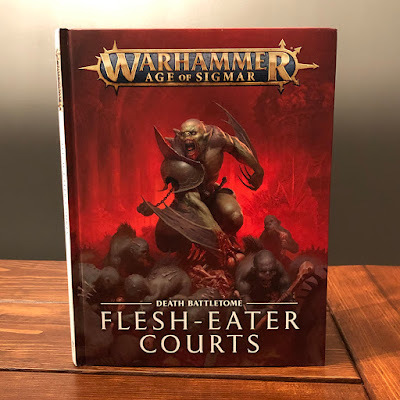 As an update to an existing Battletome I think the Flesh-eater Courts book has done a great job. The lore has been expanded on in meaningful ways, with some really cool bits added, like the parts about their afterlife. The delusions they suffer really gives them a great comedic, yet macabre twist and you can tell the writers have a lot of fun with it. As far as rules go, the warscrolls didn't get a drastic revamp, but with the addition of the grand courts, updated allegiance abilities, and even more spells and artifacts I think this will feel like a whole new army. 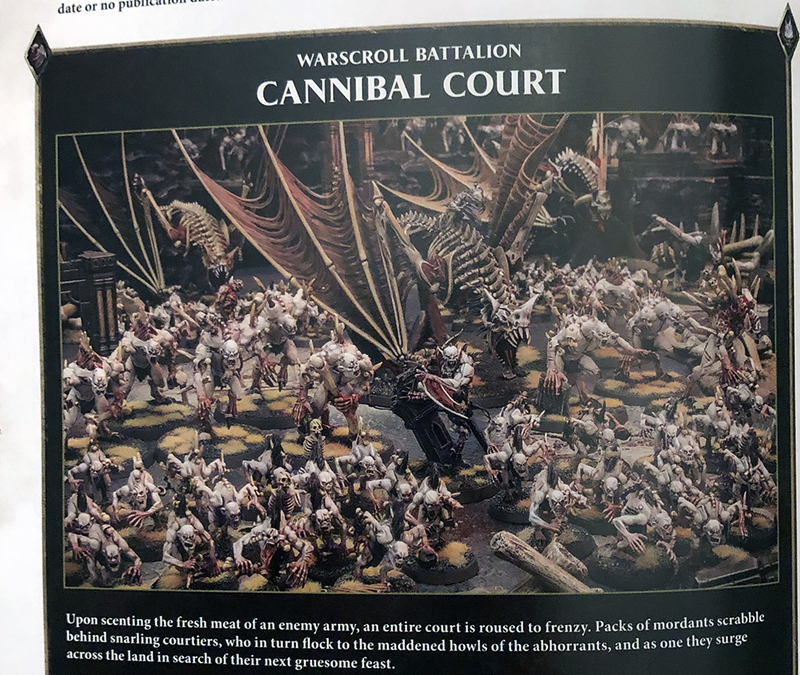 The grand courts are the biggest addition for me since it really opens up battleline choices, especially the terrorgheists and zombie dragons for Gristlegore.